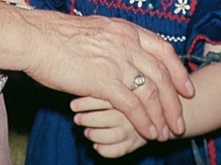 In my own conversations with women – both with children and without – aunts seem to be synonymous with “extra hands.” They are the extra hands parents need at times, and some parents need more extra hands than others, which is why Gilbert’s description of the evolutionary necessity of childless women makes so much sense to me. In remembering her own childhood, my mother will talk about her Aunt Grace as the one whose job it was to entertain the children and keep them outside and out of the hair of the other adults who had gathered together to harvest and cook and can and otherwise stock the store for winter. One of the women I interviewed comes from the Ghanaian culture where she describes family lines as blurred in general. She grew up in the United States, but within an extended network of “Aunties” who were extra parents to her. In some cases, these women had older children still in Ghana, and so, without active mothering duties of their own, they had extra time and energy for her. They doted on her but also helped raise her and discipline her when needed. Though US culture doesn’t have the same tradition of “Aunties” as many African cultures, several of the women whose nieces and nephews live nearby or who have neighbors with little children have become the trusted “aunties,” too, go-to babysitters, or the essential family savior who can swoop in at a moment’s notice to help. These are women who are entrusted with the care of the children when both parents need to travel for work at the same time or when the parents simply need a break to rest and recharge for more challenges of rearing children. Several of the women I interviewed have fond memories of “maiden” aunts who lived with them, or nearby enough to visit regularly, who really were warm and loving caregivers, who served as extra hands that could love all of these children. One of the women told me about her aunt who let her play at her house to keep her and the other children out of her mother’s hair. She went above and beyond by making clothes for the frogs they played with. Not plastic, bought-at-the-store, toy frogs. Real, live frogs. Now that’s a good aunt. Aunts offer a valuable safety net to their siblings and their nieces and nephews. “Instead of replacing a mother, they supplement her: an aunt is a reassuring rather than disruptive figure, representing security and stability, patience and wisdom” (The Complete Book of Aunts by Rupert Chritiansen, 182). Our society has plenty of disruptions to offer, and sometimes those disruptions come from within a child’s own home. One of the women spoke of her father’s sister as the gentle, loving one who always held her or a sibling on her lap. She has no memories of sitting on her own mother’s lap, a woman in a difficult marriage who probably did not know how to handle the unhappiness of her situation. For her, her aunt became the security she craved. One of my closest friends is a single mom of four. Her aunt, who helped raise my friend and her brother and really became a second mom to them, has continued with the next generation by helping my friend with her own children now. And let me tell you, even the best single mother of four needs extra hands from time to time. Other situations are even more difficult for children who need extra adult help: Whether it’s a child with severe developmental disabilities whose mother needs support from anyone in her family who has the time or energy, or children growing up in a home broken by drug or alcohol abuse who need the extra support and comfort of a responsible adult presence in their lives. There are so many children whose broken homes are made just a bit safer because of an aunt’s presence looking out for their welfare. The common thread through these stories becomes the care and love women have extended to their nieces and nephews and other young people in their lives. One woman whose parents have both died, spoke of the birthday cards and letters she still receives from aunts. What a wonderful testament of family continuing to show love for its younger generations. Another woman, in addition to being an active aunt to her biological nieces and nephews, extends her love and care to young teachers as their mentor. For those of you who have never taught, teaching is a profession much like mothering. It’s draining and all-consuming, and so to take what spare time and energy you have left to mentor the next generation of teachers is such an invaluable gift. And it’s very much like being a loving aunt. Aunts teach us things our mothers don’t know how to do or don’t have the energy to teach us. They watch over us and correct us. But most important of all, they love us. Is there something an aunt taught you that you might not otherwise have learned? Or do any of these stories sound like your own? I’d love to hear your own stories of aunts who loved you. Or maybe you’d like to share the ways you have been an extra set of hands when your brother or sister needed help with their children. Feel free to add your story to the comments below, or email me. I look forward to hearing from you! This entry was posted in good aunt and tagged aunt, Elizabeth Gilbert, family, good aunt by hopesquires. Bookmark the permalink. The world definitely needs more aunties! Hope, I really love the thing you make me notice and think about. Thanks! Thanks, Tricia. That’s what I love most about reading other blogs — including yours. It’s a great way to get fresh perspectives and see what others are passionate about that I may have never even given a second thought. I’m so glad you quoted the Elizabeth Gilbert book–I particularly loved that passage. It rang so true to me–my sister has been the extra hands without which I could not have raised my boys. She is the glue that holds our family together … the rest of our generation is too frazzled to keep anything together, much less something as complicated as a family. Thanks, Lauren — you’re the one who put me on to that book in the first place, and I really enjoyed this section about aunthood. I also wanted to say that you’re holding your family together well, not only with the help of your sister, but also as a fantastic mom dealing better with a lot of challenges than many of us could.